5793 labyrinths found. Showing 2541-2560. Sorted by country, state, city, then zip/postal code. 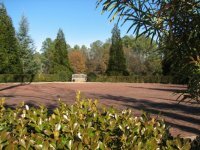 The labyrinth is located behind the church and the white house, adjacent to the gazebo. Contact the church (contact numbers above) to schedule a large group. 33 30.56° Lat. ; 82 07.15° Long. In the shade of the Oak's Welcoming Arms. The labyrinth is out behind the retreat center under the Sacred Oak. Visitors are welcome, please call to schedule a visit. 33 01.290N° Lat. ; 83.12.284W° Long. Located on the other side of the pond. Follow trail to the left across the dam and then on your right. Only during hours of daylight. Situated next to a mountain stream surrounded by hardwood forest in a tranquil, prayerful retreat setting. South of Atlanta, Georgia. 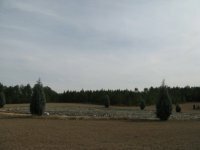 Interstate I-75, Exit 233, north 1.5 miles, the labyrinth is located on the church grounds. Labyrinth is private. Please call or e-mail for appoinment. The labyrinth is not open to the public. the labyrinth is located towards the right side of the church's memorial garden, on the opposite side of the church from the parking lot. When looking from the street, it is to the far right, at the top of the lawn, near the treeline. 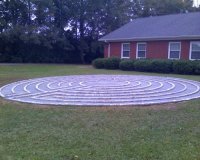 Come visit our "GOD" Labyrinth at the front of our church property at Peachtree Corners, formerly known as Norcross. Call ahead for timing of visit and directions. I was impelled to build this labyrinth as a result of a reoccuring dream. Upon completion the dreams stopped. 7 circuit with 8 foot center to allow small groups to stand together. Some shells and crystals; piece of the Berlin Wall. Private residence. By appointment only. Located at the base of Civic Center hill below the Rome Civic Center near the Rome Visitor Center. Contained within the Rome Amphitheater, a part of the original WPA infrastructure from the 1930s. 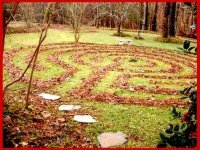 The labyrinth is overlooking Lake Hartwell in the backyard of our vacation home which we rent out as a spiritual retreat. ID#2673 The Flying Mermaid, Inc.
Silvia Pancaro, The Flying Mermaid, presents "Inner Marriage" Labyrinth Amidst Our Circle of Trees at The Yellow Brick Road. 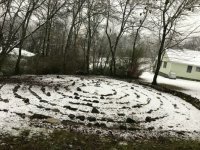 Labyrinth is open for attendees of monthly New Moon meetings. Schedule is available on www.TheFlyingMermaid.net, www.MoonCoach.com and www.CauldronOftheGoddess.com. Must email to pre-register for meetings and there is a $15 suggested loved donation. Please email to make appointment if you wish to visit Labyrinth at other times. This is a contemporary design based on Alchemical Marriage - the balanced union of the Divine Masculine and the Divine Feminine. Interestingly, the Feminine side is 'in the dark' and the Masculines side is lit up by property lighting. There are 3 possible paths to follow in this Labyrinth. Once you have parked, proceed around the left side of the building and look to the back right corner of the property. Labyrinth is tucked in far right corner. 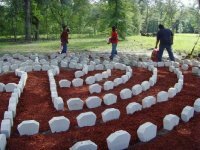 The labyrinth at Radiant Life uses the Santa Rosa design created by Lea Goode-Harris, PhD. There are seven circuits and a small square on the fourth circuit where no one walks. 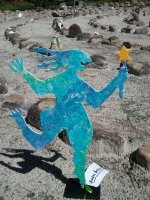 This heart space is approached from all four directions and can be used in many symbolic ways while walking. Located between the Sanctuary and Chapel - signs will direct you. Benches and information box onsite. Welcome! Skidaway Island is located 11 miles south of Savannah's Historic District and is accessible by car via the Truman Parkway. Exit the Parkway at the Temp. End, turn left, continue 4 miles, cross the bridge over the Intracoastal Waterway, turn left at the first light onto Skidaway Island State Park Rd. The Church is on the right. (Skidaway Island State Park is 1/10 mile beyond the Church entrance).